Of course, you can also take attendance using the Course > Attendance view. Get the iOS app at the Apple App Store. The Populi app works on devices running iOS 9.0 or later. Get the Android app on Google Play. The app works on devices running Android 6.0 or later. 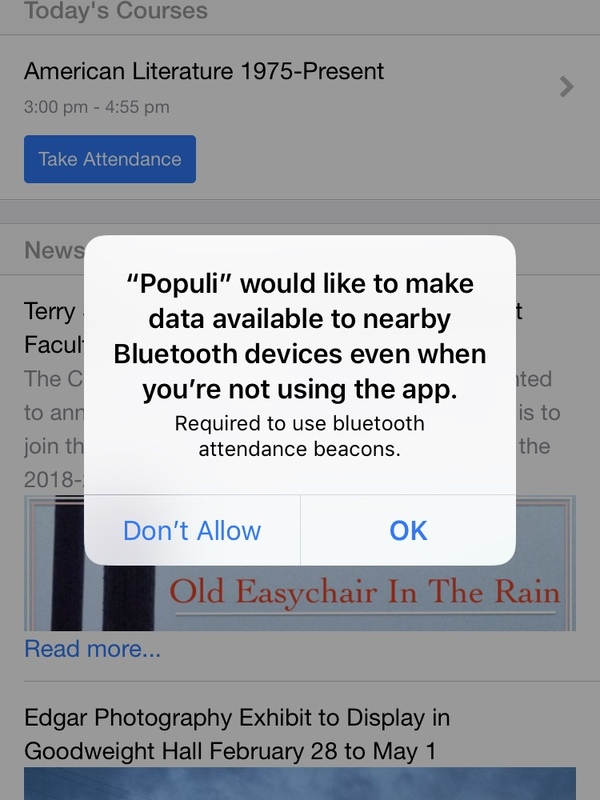 Populi uses your phone's Bluetooth radio to detect your students' own Bluetooth-enabled devices running a Populi mobile app. In order to do this, you need to grant the app access to your phone's location. When you first log in to the app, you'll be asked to allow Populi to access your location while you're using the app. Tap Allow to permit this. iOS will also ask you if you would like to make data available to nearby devices even when not using the app. Again, tap Allow. In iOS, go to Settings > Privacy > Location and find the Populi app in the list. In Android, go to Settings > Bluetooth and make sure Bluetooth is set to On. On the day of the course meeting time, you'll see a Take Attendance button on the app Dashboard view. Tap that to go to the course's attendance view. You can also tap to summon the app sidebar. Go to My Courses > Select the course > Attendance. Once there, tap the meeting time. There are three ways to take attendance: Entire class, One at a time, and Beacon. Here's how to set up the beacon, which takes attendance automatically. 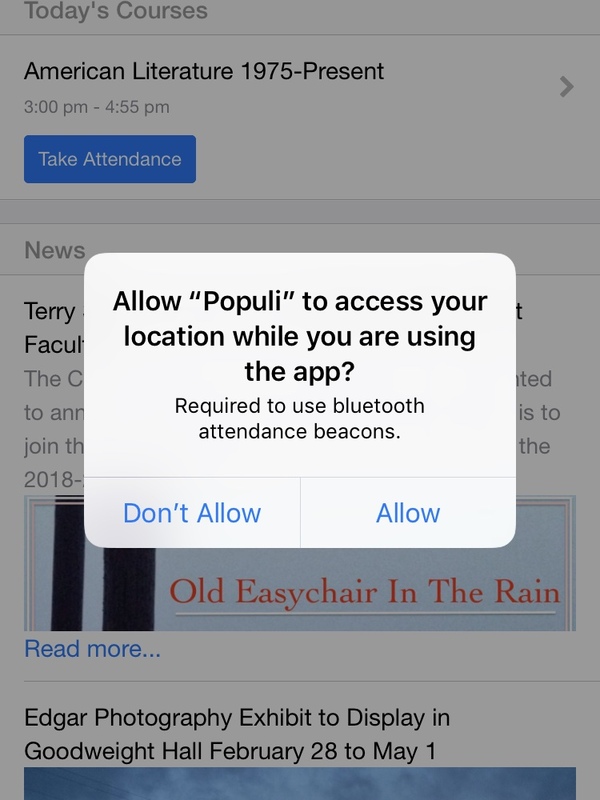 The first time you do this on iOS, you'll be asked to allow the Populi app to share information with other devices even when you're not using the app. Tap OK to allow this. You'll only need to do this the first time you use the beacon! The first time you do this on Android, you'll be asked to allow the app to use Bluetooth. Tap Allow to enable this. Before students begin arriving to the class, tap Start Beacon. Select how long you'd like to use the beacon to mark students Present. You can mark them present until you stop the beacon or until a specific time. Then set a Tardy time. Toggle to mark students Absent after that time. 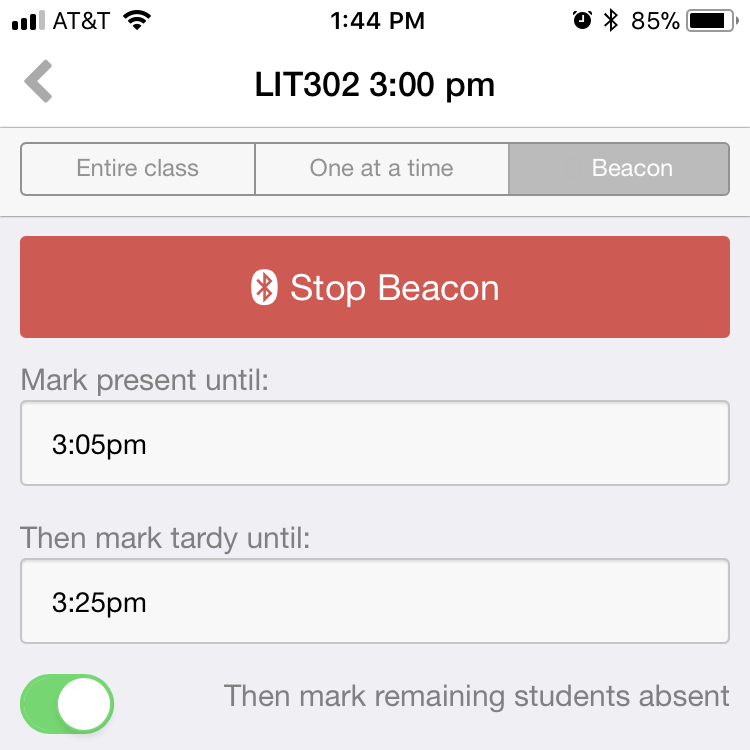 As students with the Populi app arrive at your class, the beacon will automatically record their arrival time and mark them Present, Absent, or Tardy. Have your students read the instructions in this article to make sure they know how to set up the app to record their attendance. 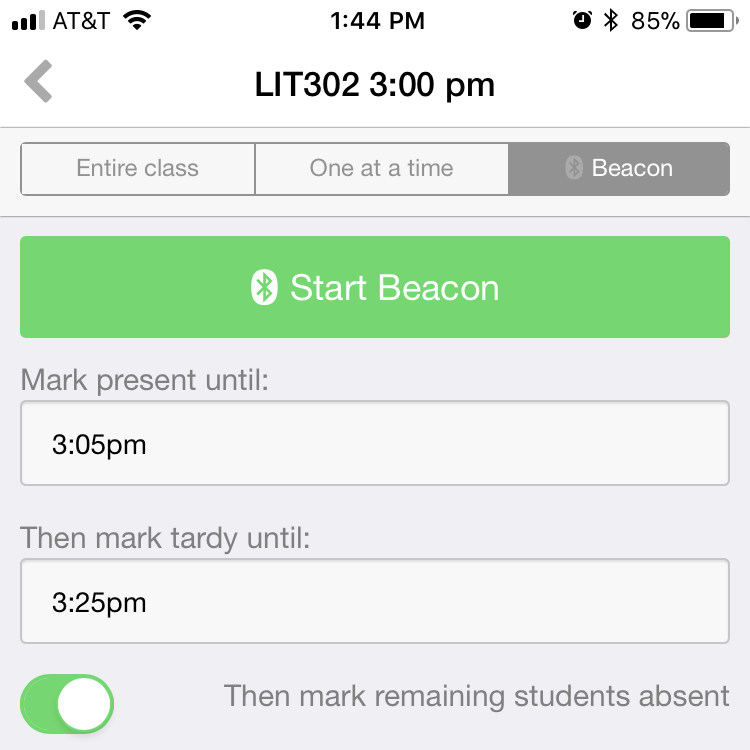 If you're not using the Bluetooth beacon, you can take attendance using the Entire class or One at a time modes. Entire class: Just tap the appropriate symbol for each student. Their attendance is saved automatically. One at a time: This option takes you through the students in alphabetical order. Tap the appropriate status; it will automatically save and take you to the next student in the list.